Where do you find your iPod nano's Serial Number, Model number, and Version number? Two answers: first, these three pieces of information are available, and visible on Summary tab of your iPod when you connect it to your computer (Mac or PC), and iTunes opens (if iTunes doesn't open when you plug in your iPod, you need to enable iTunesHelper). But as you'll learn in this tutorial, your iPod nano itself contains this information, and we'll explain how to get to it. Your iPod nano now gives you what you came for, and more: your disk space usage, Serial Number, Model number, and iPod software Version number, all listed in that one screen. If you ever need to call Apple support about your iPod nano, here's how you can find the information they'll likely ask for, without having to be in front of your computer, or have your iPod nano connected to iTunes! Tip: if you look closely at your iPod nano's Version (the iPod software version installed), you'll notice that this number ends with a few letters; these indicate whether your iPod nano was formatted for Windows (PC) or Mac. 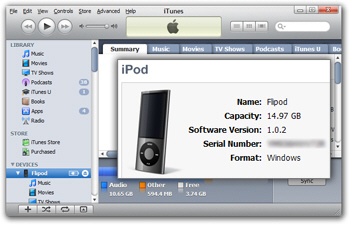 You can still connect your nano to a computer of the other platform (operating system), but your iPod uses one primary format by default. How do I restart my iPod nano? How much free space left on your iPod? These iPod nano tutorials target the 5th generation nano (not latest version), and apply to nano 4th generation and 3rd in some cases.